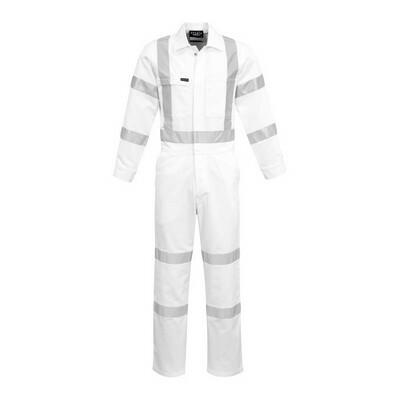 Mens Cotton Drill Coverall with 3M Scotchlite Reflective Tapes. 190gsm - 100% Cotton Drill. Utility pockets. Metal press buttons. Elasticised at centre back waist Colours: Fluoro Orange/Navy. Fluoro Yellow/Navy. Sizes: 77R, 82R. 87R, 92R. 97R, 102R. 107R, 112R. Mens Pre-Shrunk Heavy Cotton Action Back Overall. 310gsm - 100% Cotton Drill. Regular size. (UPF) 50+, excellent protection. Utility pockets. Elasticised waist. Colours: Khaki, Navy. Sizes: 77R, 82R. 87R, 92R. 97R, 102R. 107R, 112R. Mens Pre-Shrunk Heavy Cotton Action Back Overall. 310gsm - 100% Cotton Drill. Stout size. (UPF) 50+, excellent protection. Utility pockets. Elasticised waist. Colours: Khaki, Navy. Sizes: 87S, 92S. 97S, 102S. 107S, 112S. 117S, 122S. Mens Pre-Shrunk Heavy Cotton Action Back Overall. 345gsm - 100% Fine Cotton 100% Duck Weave double strength pre-shrunk Cotton canvas. Utility pockets. Roll-up sleeves. Double stitched. Knee pad provision. Colours: Khaki, Navy. Sizes: 77R, 82R. 87R, 92R. 97R, 102R. 107R, 112R. 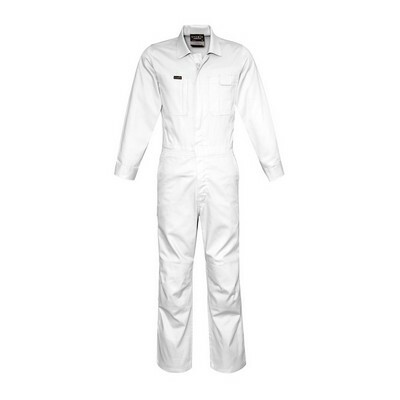 Mens Cotton Drill Coverall. 310gsm - 100% Cotton Drill. Regular size. (UPF) 50+, excellent protection. Utility pockets. Heavy duty nickel plated studs. Pre-shrunk & mercerised fabric. Colours: Khaki, Navy. Sizes: 77R, 82R. 87R, 92R. 97R, 102R. 107R, 112R. 93% Meta-Aramid 5% Para-aramid 2% Antistatic, 155GSM HRC 1 inherent protection at a light 155gsm weight Concealed two way FR zip centre front closure as specified in NENS Stand up collar and gusset sleeve for extra protection All Trims are FR rated Two chest pockets and one mobile phone pocket with covered FR press stud closures Two side slant pockets and one large cargo pocket FR rated mesh in the under arms and upper back to keep you cool Two way radio and gas monitor loops on the front shoulder yoke Loxy FR Tape FR rated label that clearly shows FR rating of garment Sizes 3/77 - 12/122. Colours Available : Orange. Sizes Available : 77 | 82 | 87 | 92 | 97 | 102 | 107 | 112 | 117 | 122. 100% Cotton Drill - 190 gsm Made from cool and comfortable lightweight cotton drill Two chest pockets, one with mobile phone compartment Two side hip pockets One back hip pocket Two side access pockets to reach your internal pant pockets Zipper front closure Sizes 3/77 ,12/122. Colours Available : Orange | Navy | White. Sizes Available : 77 | 82 | 87 | 92 | 97 | 102 | 107 | 112 | 117 | 122. 100% Cotton Drill - 310 gsm Compliant with Australian night time road work requirements with X back configuration Bio Motion tape configuration to improve recognition of human shape at distance Made from durable hard wearing cotton drill Two chest pockets with pen partition Two side hip pockets One back hip pocket Two side access pockets to reach your internal pant pockets Press stud closure Sizes 3/77 - 12/122. Colours Available : White. Sizes Available : 77 | 82 | 87 | 92 | 97 | 102 | 107 | 112 | 117 | 122. 100% Square Weave Cotton Ripstop - 240 gsm Large under arm and back venting to keep you cool Mechanical stretch to give you more freedom of movement Two chest pockets with vertical zipper for easy access Large cargo pocket with unique side zip pocket built into side bellow Mobile phone pocket Zip gusset in hem to fit over your boot Two side access pockets to reach your internal pant pockets Hoop reflective tape patterm Double layer hem for durability Reinforced at all key stress points with bar tacks Sizes 3/77 - 12/122. Colours Available : Orange/Navy | Yellow/Navy. Sizes Available : 77 | 82 | 87 | 92 | 97 | 102 | 107 | 112 | 117 | 122. Mens Action Back Overall in Heavy Cotton Pre-shrunk Drill. 310gsm - 100% Cotton Drill Regular Size Fit. Day use safety wear. Utility pockets. Elasticised at centre back waist 2 way side pockets. Colours: Fluoro Orange/Navy, . Fluoro Yellow/Navy. Sizes: 77R, 82R. 87R, 92R. 97R, 102R. 107R, 112R. Mens Action Back Overall in Heavy Cotton Pre-shrunk Drill. 310gsm - 100% Cotton Drill Stout Size Fit. Day use safety wear. Utility pockets. Elasticised at centre back waist. Two side pockets. Colours: Fluoro Orange/Navy, . Fluoro Yellow/Navy. Sizes: 87S, 92S. 97S, 102S. 107S, 112S. 117S, 122S. 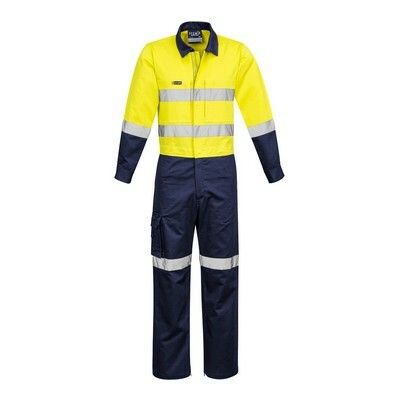 Mens Regular Size, Cotton Drill Coverall. 310gsm - 100% Cotton Drill. Utility pockets. Metal press buttons. Elasticised at centre back waist Colours: Fluoro Orange/Navy. Fluoro Yellow/Navy. Sizes: 77R, 82R. 87R, 92R. 97R, 102R. 107R, 112R. 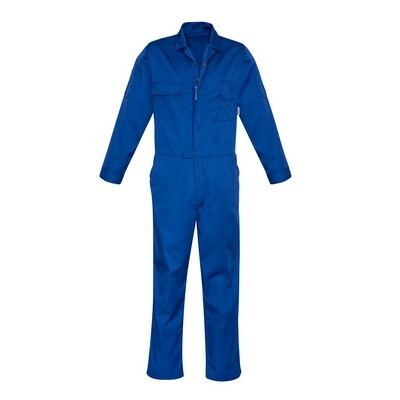 Mens Stout Size, Cotton Drill Coverall. 310gsm - 100% Cotton Drill. Utility pockets. Metal press buttons. Elasticised at centre back waist Colours: Fluoro Orange/Navy. Fluoro Yellow/Navy. Sizes: 87S, 92S. 97S, 102S. 107S, 112S. 117S, 122S. 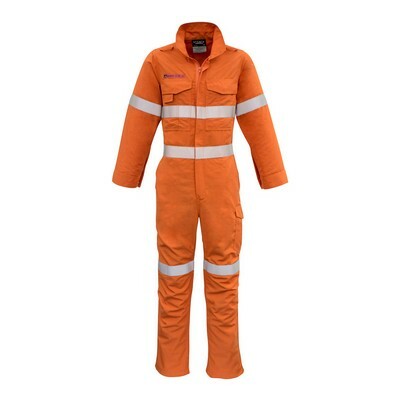 Mens Cotton Drill Coverall. 310gsm - 100% Cotton Drill. Stout size. (UPF) 50+, excellent protection. Utility pockets. Heavy duty nickel plated studs. Pre-shrunk & ercerised fabric. Colours: Khaki, Navy. Sizes: 87S, 92S. 97S, 102S. 107S, 112S. 117S, 122S.